Good morning Monday! 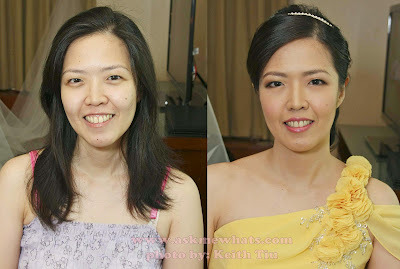 I'm not sure how I will look like today as I spent the weekend doing makeup for a wedding then headed straight to Tagaytay for an overnight bonding with my high school friends! When I'm with my friends, stories are overflowing and as expected, we chatted til 4:30am! With the tiredness and lack of sleep, it was all worth it! We all had an awesome weekend! 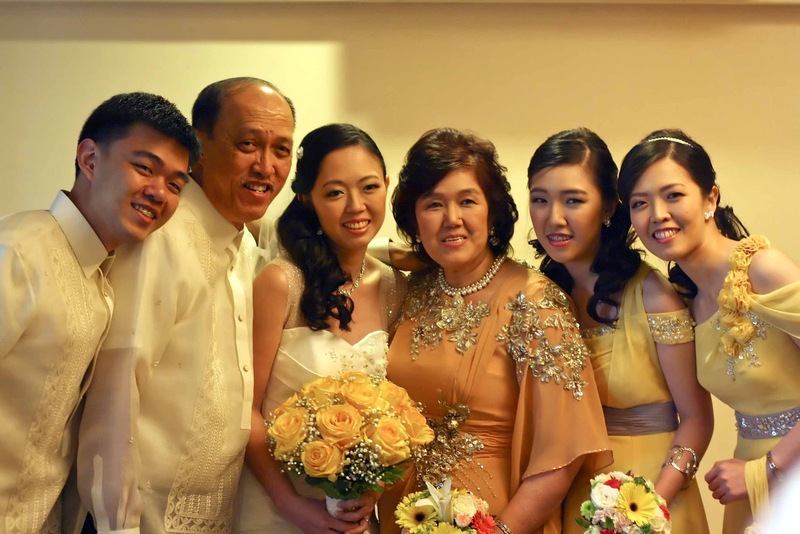 Speaking about Bridal Makeup, 2 weeks ago, I've done another bridal makeup for a wonderful family! (Thank you Lord for giving me a chance to work with really nice and inspiring people -- both client and fellow suppliers!) It was also a first, after almost 5 years that I saw the wonderful and talented lady who made my own bridal gown, Ms. Zandra Lim! I highly recommend her as my gown was a perfect fit and it was even more beautiful as expected! Back to the bride and her family, I have never met the bride and I was booked just a couple of weeks before this important day! I communicated with the bride's sister over email and we got some pegs on the hairstyle and makeup looks they want. The communication was a breeze! The Bride has gorgeous skin to start with so I've decided not to pile on too much foundation. She did request for a super light (almost nothing) eye shadow but I talked her out of it! I explained to her how I wanted to focus more on her eyes by creating a fake"depth". With that in mind, a bit more eye shadow may be needed. A combination of dark and light eye shadows blended well together to create a nice "smoked out" effect making the eyes appear larger which is one of the ways to do eye makeup for monolids. Thankfully, she puts everything on my hands and she's such a doll! One look at the sister of the bride (whom I communicated a couple of times prior to meeting her), I already have a look in mind to bring out her natural beauty. I've decided to play with flattering eye shadow colors for her yellow undertone --- browns, golds and light yellow. For the foundation, it was effortless on my part as she has great skin to start with! I took into consideration how fair she is so I've decided to play with contouring powders and highlighters for a healthy and natural glow! I planned on creating a look that would focus her eyes. 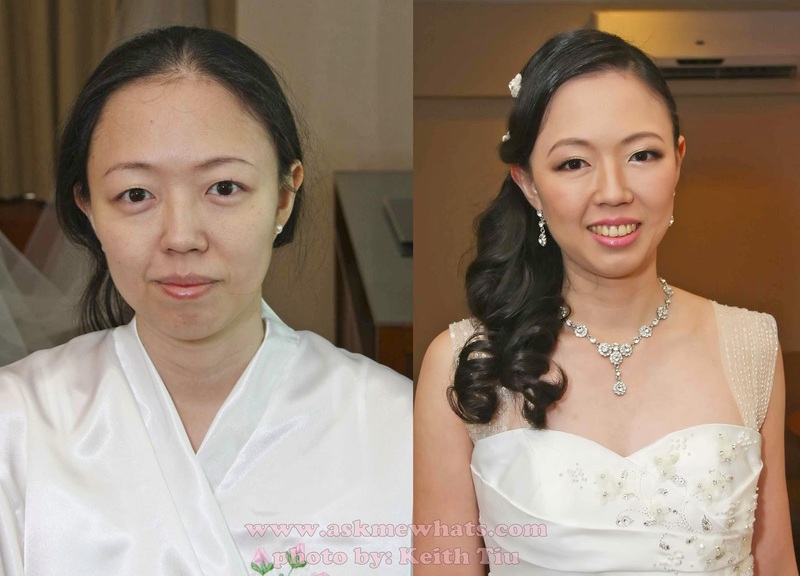 To do so, I began by concealing her under eye circles then add up a tiny bit of lighter colored foundation at the center of the face to draw attention on her best features. Various eyeshadows from Urban Decay Book of Shadows Palette and MAC. A tall yet super young girl! She's only 18 so I've decided not to pluck too much of her brows and give her an overall young, yet fresh look! I've decided to use pinks on both her cheeks and lips and lift up her "almost" droopy-yet-very cute eyes. I can see that her skin oils up a lot even during makeup application (and it was also confirmed by her.) 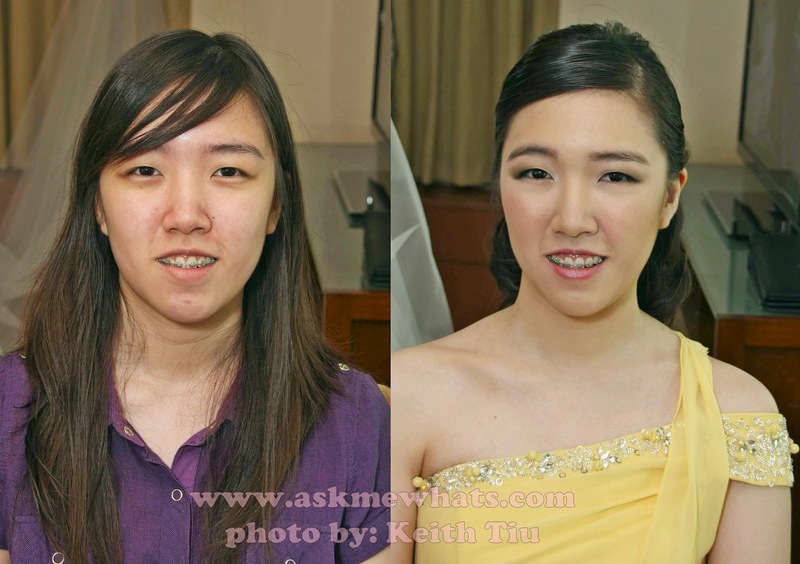 I've decided to focus on priming her face with an oil-control primer to keep her makeup intact the whole day! I got her foundation shade by matching it to the color of her neck. P.S. Oil Control Sheets are a MUST! Various eye shadow shades from L'Oreal Hip, Bobbi Brown and MAC. The mother of the bride, again, is one of the most important people a Wedding Day so attention to her makeup is also needed! For any MIL whom I worked for in the past, present a future, I always aim for non-cakey, almost no foundation look to create a younger looking vibe! Who wouldn't want to look young if you're in your 40's, 50's, 60's? To start it off, it is very important to moisturize the client's face really well and look for a "SUPER" matching foundation! 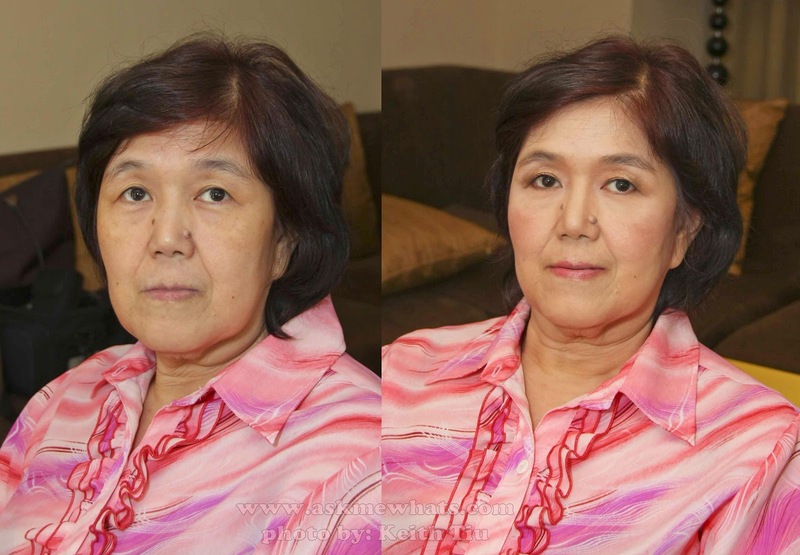 For this particular MIL, I've decided to create a "fake" deep crease by adding a mid-tone matte brown shadow shade at the exact hallows of the outer-v and highlight the inner corner of her eyes to lift half of her upper face giving her an instant, non-surgical, no laser Botox Treatment! Various eye shadow shades from MAC, Estee Lauder and Bobbi Brown. Sorry I can't remember the lipstick! And of course, smiling + true happiness will exude a "gorgeous" vibe to anyone you face! Note: All hair done and styled by Kim. great job sis!!! the sisters are so pretty :D and i love their yellow gown! Xin thank you! :) Their gowns are so pretty! I love their natural makeup look. i love the looks and your posts! !